Earn Sacrificial Hearts for more powerful Sacrifices! 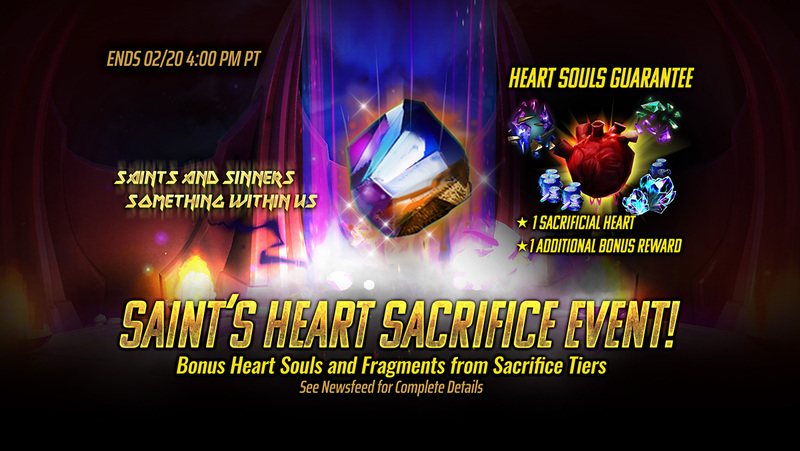 Get new Heart Souls from Sacrifice to earn Sacrificial Hearts and other valuable bonus rewards! From now until February 20th at 4 PM PT, the Heart Soul has become available! The Heart Soul is a limited time event soul which guarantees a 3-5⭐ Sacrificial Heart that grants high sacrifice essence! **Did you know you can double your rewards for a sacrifice? Doing a sacrifice with a higher amount of essence than the minimum required gives you a chance of getting double rewards based on how much you’ve exceeded the essence requirement. If you double the essence required for a tier, you’ll be guaranteed to get double the rewards! The second way you can earn Heart Souls is from our Sacrifice themed Event Challenges. Meet the requirements to earn up to 10 Heart Souls, 1 Full Set of Saint Talismans, plus other rewards! Saint Talismans are red talismans with a 3 set effect that is not available anywhere else! Equip a full set to Revive the first ally that dies in battle with Invincibility and HP Regen for 1 turn.